We are in the midst of a worship series in our Emergent Worship service on the Fruits of the Spirit. Our Scripture for each Sunday is “But the fruit of the Spirit is love, joy, peace, patience, kindness, goodness, faithfulness, gentleness, and self-control. There is no law against things like this. Those who belong to Christ Jesus have crucified self with its passions and its desires. If we live by the Spirit, let’s follow the Spirit. Let’s not become arrogant, make each other angry, or be jealous of each other” (Galatians 5:22-26 CEB). Each week we focus on one or two of the fruits in detail. The week we did Love and Joy, I wanted us to ground those concepts in our relationship with God and emphasize that is maintained through prayer. However, after one person told me that praying is boring, I decided to search out a new way of praying. 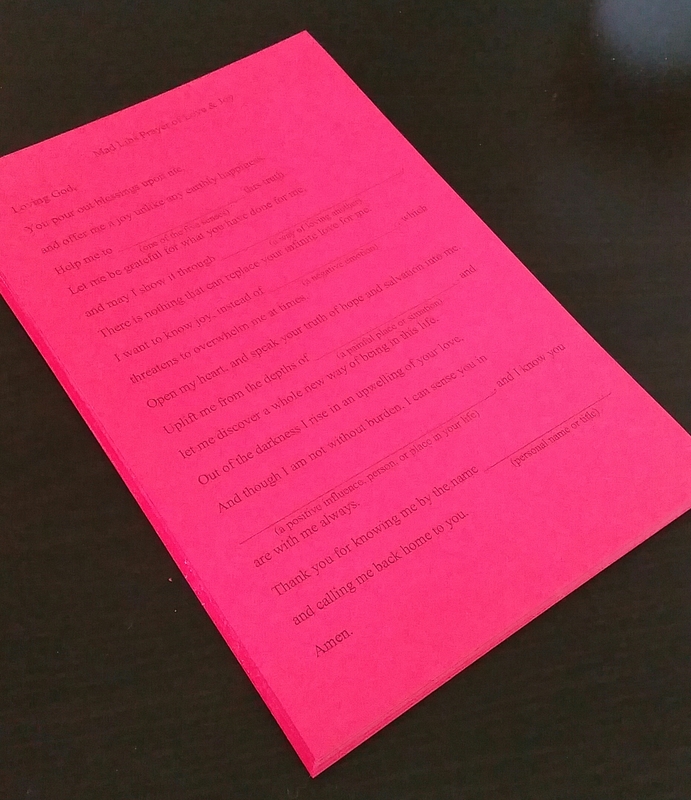 I made a Mad Libs prayer card that we handed out during worship, filling it out during a time of musical reflection. It was a big hit, so I’m sharing it. You can do it like a traditional Mad Libs, plugging in the blanks, then going back to read it. Or you can read along and fill it in as you go, with some notion of the prayer you are composing. There’s no right or wrong way, and it can be a different prayer each time you do it. I and the people of #Emergingat945 hope it will be a means of grace for you, and nontraditional one at that. See? Prayer can be fun and exciting. and offer me a joy unlike any earthly happiness. Help me to _____(one of the five senses)_____ this truth. and may I show it through _____(a way of loving another)_____. There is nothing that can replace your infinite love for me. which threatens to overwhelm me at times. Open my heart, and speak your truth of hope and salvation into me. and let me discover a whole new way of being in this life. and I know you are with me always. and calling me back home to you.